Through the first week of October, autumn had barely been on the radar. Seeing pumpkins in the fields and corn stalks turning sandy-brown were gentle reminders, but the sun was warm and the well-selected flowers were still blooming. The couple of rainy days could be forgiven as the temperature didn't plummet with the downpours. But then something nasty blew in from the far north. We longed for the satellite images of CNN International's weather map that always helped us understand the weather coming our way for 4 or 5 days at a time. But French village hotels rarely have foreign language TV stations and we had to settle for constructing our own cruder story by checking the online forecasts for the week ahead. Photo stops had to be quick on the cold days. But the clumsily assembled story was hard to miss: night time temperatures that had been in the 50's were dipping to freezing; highs might not make it out of the 40's; and wind chills would be below the freezing point some days. "Cloud cover" wasn't a parameter I was accustomed to noting but given the low temperatures and high winds, "sun or no sun" would make the difference between being comfortable or shivering, especially during our picnic lunches. Each night that we had internet access we reviewed the every-3-hour summaries for the daylight hours for the next 3 days to plan our response. The days of primarily tailwinds could be higher mileage days whereas direct headwinds would demand a shorter riding day; heavy cloud cover would require more clothes as the 'comfort factor' would be substantially lower; and no point in pushing for an early start if there might be ice on the roads. We approached the harsher riding conditions as though they were yet another twist in the greater adventure and were comforted by seeing that fairer weather was in the long range forecast. But for the interim, rallying our stoicism did again trigger the recurrent question "Why are we doing this?" The answer is always the same "For the exercise." We are committed to the investment in long term health that daily exercise can bring. Ninety minutes to 2 hours a day of CV exertion is holding as what's needed for optimal health, not just an improvement in health. And if one is going to spend in the range of 45-60 hours a month exercising, it makes sense to be experiencing or accomplishing something more than that along the way. "End of discussion" one more time as we braced against another cold gust and talked-up the joys of cycling in crisp fall weather. As we continued west and south through the interior of France, our lodging hassles eased a bit, for no apparent reason. Suddenly, even procuring a room for a weekend night on the same day was a snap when days earlier mid-week rooms were fully booked. The quality however continued to see-saw unpredictably. Sometimes our best room for the week was the cheapest and the worst room was the most expensive. Michelin Red Guide stickers prominently displayed on the hotel door were no predictor of our contentment, though in the past we found their price point to be too high and that their sense of a lovely experience diverged from ours. Charming villages often don't make for a comfortable night's stay. Leaden feather pillows; bedding smelling of mildew; roughly juxtaposed decors of a half-dozen competing trends (including our first seriously purple bathtub in a room with red carpet); and bathroom sinks that soaked our toes in new and creative ways were the aspects of French 'charm' that we loathed. We continued to consider motel-styled modern "boxes" our lodging oasis's but we occasionally stumbled upon an abode that seemed like it reflected the 'French country charm' ideal that others couldn't pull-off. Then we weren't peering into the closet to locate that extra electrical outlet or washing our hands after stashing a particularly disagreeable bedspread. 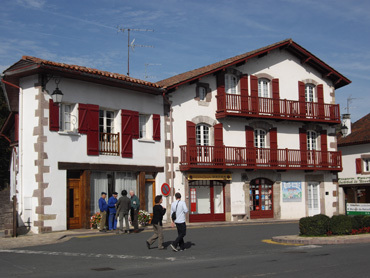 We did however adore 2 aspects of French lodging that have evolved since we began traveling in 2001, which were the ban on smoking in hotels and the prevalence of free wifi ("wee-fee" in French) internet connection. Apparently the smoking ban went into effect in January of 2008 but we didn't notice it until this fall. Perhaps it was because we were zigzagging in and out of France on the borders with Spain in 2008 and with Italy earlier in 2009. Whether we were inattentive or they were inconsistent, we fully enjoyed the almost 100% compliance in French hotels this fall. I have a Mother-Superior nose for smoke and other odors and I could certify the largely successful compliance. At some point in 2009 the flag must have dropped on free wifi in hotels as this fall it was almost everywhere we were in France. It was by quizzing an Ibis Hotel chain clerk that I learned that in September the chain had switched to free wifi in all of their hotels in the country. Her customers complained because a nearby fast food chain had free wireless when the hotel didn't and in her mind that was what triggered the policy change. I suspect it was a more global pressure that prompted the change in internet fee structures in hotels as even one of the large French supermarkets had a free wifi corner. Unfortunately for us, the Orange brand of service the Ibis chain used banned streaming so we weren't able to use our Skype internet phone service when in their hotels. But even with limitations, having wifi added to the short list of traditional competitive "must-have's," like a TV and a telephone, was a huge help to us as travelers--especially for tracking the weather. Oh, and the bathtubs. French hoteliers do pony-up a tub more often than their peers in most other countries, though it tends to be more of a regional bias than an national one. Tubs are wondrous for cyclists. I'm basically a shower person but sometimes it seems like too much effort to stand at the end of a riding day and then being able to collapse into a tub is mighty welcome. And on the fall days when the chill in the room reminded us of being outdoors, full body emersion convinced my toes that it was safe to be out. The interdependence between the daytime weather conditions and the features of our abodes becomes markedly more important as the weather turns cold. On the cold, cold mornings in France this October we headed out in 3 or 4 layers of our warmest clothing to buffer us from the below-freezing wind chills. The persistent undulations in the terrain deterred us from wearing our rain suits as wind barriers many days as the sweat pours out on steep grades no matter what the temperature. Unfortunately, those accompanying, persistent body odors penetrate all the layers of clothing worn so the amount of laundry we should be doing each night in the winter triples over the summertime regime. But hand washing 9 garments in a bathroom sink every night for me alone is out of the question. Bill doesn't get as cold and so has a few less items vying for a dunk, but his is still an overwhelming task. At a minimum, we each hope to wash the shirt and pant layer closest to our skin each night. Heavy winter socks are the next in queue if they are likely to dry by morning. Other items in the successive layers take their turns at the sink in one's and two's depending on the circumstances and the urgency. Laundromats would be ideal, but we go many months at a time without seeing one. Under the best of conditions, such as when a bathtub is available for laundry, it's a possibility to wash everything at once but the capacity to dry the garments must be factored in first. Given we are wearing almost all of our warm clothing each day, all of the clothing must be completely dry by morning to be able to step outside. So ultimately it is the drying capacity of our room that is the real rate-limiting factor when deciding how much laundry to do. 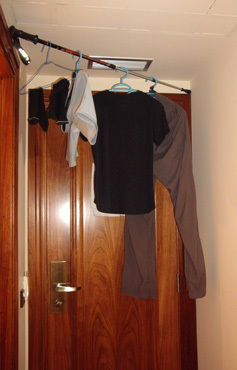 Every night our room must be analyzed for its laundry drying capacity: the current temperature when we arrive; the potential for increasing or maintaining the room temperature; the current humidity; the availability of windows, doors, and fans for reducing the humidity as the drying progresses; and the space available for hanging garments, preferably near the ceiling, the warmest strata in the room. The threat of a mosquito invasion when we open the room to release the damp air also must be considered in the equation. Balancing acts with our trekking poles. We hand wash as many garments as we think will dry given our careful analysis of the room. Then each garment drips in the shower stall or bathtub. As each piece ceases dripping water, it is rolled in one of our viscose travel towels which can be wrung out after each garment so as to endlessly retain its absorbing capacity. It can easily take an hour to wash, wring, drip, towel-wring, and hang 4 garments using a small sink. So arrival time is factored in too as a late arrival limits both the time available to spend washing and the amount of drying time. Our Brive, France Ibis Hotel room was perfect for a big batch of laundry and we seized the opportunity like hungry piranhas attacking a fresh kill. It had a small bathtub, though we had to provide our own stopper. We arrived in mid-afternoon and after too much cajoling, managed to secure the last south-facing room available on a sunny though cold day. It also happened to be 1 of the larger rooms in the hotel, which meant that the air volume available for drying our clothes was greater. It was sun-warmed when we arrived as opposed to the first room we were offered, which felt like an ice box. Instead of our usual orderly unpacking routine, we both peeled off our many layers of clothes and dove into our panniers for summer articles to wear indoors the rest of the day. Bill started filling the tub as we both tossed in all of our winter clothes except our heavy gloves and hats. This would be a community project, a mass washing. We took turns through numerous wash and rinse cycles with a few items, like dusty socks, getting a special pre-wash in the sink. Our telescoping walking sticks were first used across the top of the tub for dripping racks and then were poised at ceiling level around the room for hours of air drying. Normally our 2 extended walking sticks are sufficient for drying but on this day our cord clothes line was also strung most of the length of the long room to handle the exceptional volume. We were very lucky in Brive to have the perfect combination of a sunny, dry day and a large south-facing room to dry our laundry. Several other nights when in smaller rooms and only washing the minimum, we didn't fair so well. In those rooms the heat/humidity combination was just wrong: our sleep was disrupted by the accumulating moisture in the air and we awoke to still-damp clothing. On those mornings there was a last-ditch effort upon arising to dry our clothes by opening the room door into the hall and a window to the out-of-doors to blow out the saturated room air and replace it with air with a greater moisture retention capacity. So, in addition to watching the weather forecasts for riding conditions in the fall, we watched the forecasts to time our laundry too. The promise of a warmer day made it worth postponing washing the heaviest garments as they were more likely to get dry. And a warmer day here and there would reduce the need to wear so many clothes. 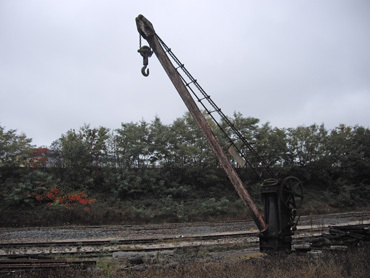 These old rail yard cranes always fascinate us. Like the weather, the visual themes changed as we drifted south while heading west across central France. We'd watched the transitions: herons, locks, and fishermen on the canals; hawks and cows in the rural swathes; and now in the mixed urban and rural areas it was the string of memorials to the WWII martyrs and the dealers selling giant in-ground, fiberglass swimming pools that stood out. The war memorials were a very familiar sight and we take note of them in each country. Our slow mode of travel makes it compelling to honor such history, such suffering, and the losses. The many memorials all serve to remind us of the varying degrees to which that war continues to shape the cultures through which we pass. The swimming pools were another matter however. Nowhere before had we seen so many dealers with pools standing on end so prominently displayed on the road. "Real hot here in the summer?" or "Prosperity boom in the region?" were about all we could come up with for explanations. We rode past them with little understanding of their significance. A powerful, 10-second shaking was all it took. More concrete however was stopping to watch a tractor operator jiggle a series of walnut trees with an attachment that pulsed like a jackhammer. 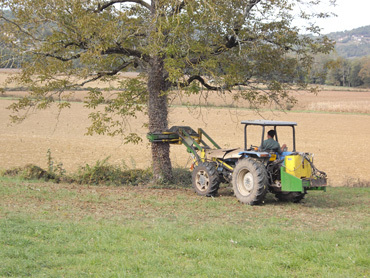 The man carefully pressed a large horizontally mounted bar to the trunk of each tree and then vibrated it for about 10 seconds. Nuts, leaves, and rotting branches came raining down. We wondered if he was working in the direction opposite to which we were riding as over the next half hour we saw small groups of people collecting nuts from the ground from 3 other orchards. We also pondered if the shaking was detrimental to the health of the trees, a matter we'd read about in relation to olive trees. Watching the changes in the vegetation as we travel is always interesting, with new varieties appearing every few days on this traverse of France. Pampas grass and Judas trees were the latest additions with tamarisks and Indian bean trees having appeared a few days earlier. Before that it was yews with their little red berries that were incorporated into hedges. And it was in this area that we began seeing snowy-white egrets for the first time in months. Their bright-white feathers reminded me of the pollution-tinged egrets we saw around Cairo several years before--they, like us, became coated with an adhering residue deposited from the air. Dordogne limestone terraces--shelter rudiments for 50,000 yrs. Map Man's meander through central France had been guided by an obscure motive, which was to visit the Musee de Prehistoire in Les Eyzies de Tayac. 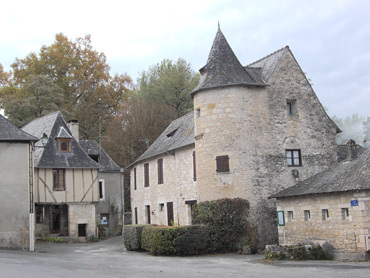 This museum in the Dordogne, the region of the prehistoric cave paintings and rock carvings, had been closed when we systematically visited as many of the historic sites as possible back in 2004. At that time we longed to see the treasures hidden away behind those locked doors. This museum, as other trophy sites that we miss for one reason or another, had been filling space on my list of things to do "Next Time" we were in the country. Bill had remembered it and made it the focus of our route through France this year. The sudden changes in the landscape as we entered the Dordogne river basin activated our memory banks. It was the low limestone cliffs rounded by water erosion that signaled the historical significance of the area. For miles and miles several eras of especially harsh water erosion had gone beyond rounding the vertical surfaces, they had gouged-out shelves, long indentations, that had provided half-made homes for people over the millennia. 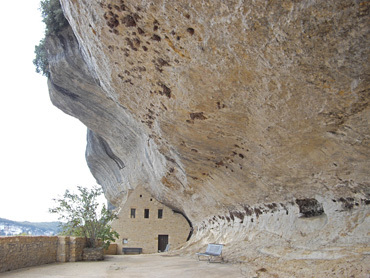 Next it was the directional signs to familiar caves and archeological sites that further signaled we were in the Dordogne, that we were in one of Europe's hot-spots for ancient finds. It was here that temporary settlements had been intense and the conditions had been right both to preserve and then reveal the ancient remains of burials, tools, and meals. The stones & bones were beautifully displayed....but boring. Despite difficulties in accessing their website to check for closure dates and narrowly missing a school holiday, we arrived on an appropriate day for our mission and Bill secured a hotel room literally next door to the museum. But alas, it was pretty much a bust. Indeed it was a brand new museum with fresh, modern displays but the emphasis was 'old school,' which for us means the emphasis was on displaying finds instead of making comprehension the objective. It was the ultimate in a 'stones & bones' repository with thousands of each in neat rows. I am fascinated by the subject of evolution and the development of technology, regardless of how rudimentary, and yet my eyes glazed over upon viewing the elegant new exhibits. 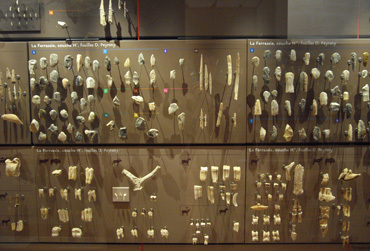 Had we not already had a command of the species names of our most distant ancestors and the names the French prefer for the half dozen 'lithic' cultures of the Upper Paleolithic Period, we would have been totally snowed and frustrated. I imagined that the museum before us was an example of what can go wrong when there are conflicting visions of the final product. The folks on the committee who prevailed in getting the videos installed of flint knapping demonstrations breathed some life into the whole thing; the folks who wanted to display as many little treasures as possible killed any enthusiasm the videos generated. My best hope for this museum with too much is that a new administrator will come along and add an audio guide that spins a tale that captures the imagination with comments like: "See how many possibilities were created by the new ability to make a hole in rock or bone with this stone tool." There are so many astounding, world-class sites within a few miles radius of the museum and yet they favored the scholarly approach that buried the significance of the associated artifacts beyond the reach of even the initiated. 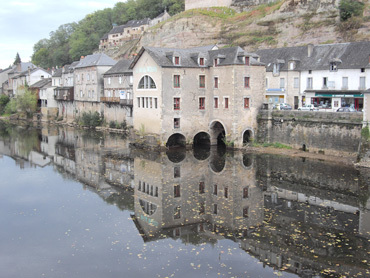 Disappointed, I closed my extensive electronic Paleolithic eras files added to my PDA during our 2004 Dordogne visit without adding a single historical note and we resumed our journey towards the sea, towards the Atlantic. We rode westwards for several more days and arrived at Bordeaux, about 30 miles from the Atlantic. But vivid memories of a particularly boring ride along the southern coast of France sent Map Man to his maps. Some years ago we tried hard to ride along the sea in this region in the opposite direction but couldn't--the road instead meandered inland through tree farms and at times, was forced farther from the water by military land holdings. It was a decidedly un-coastal and un-scenic road and Bill vowed never to do it again. So, without quite dipping our toes into the Atlantic at the end of our month-long "mountains to sea" voyage, we turned due south--on a train. We rode into Bordeaux on our bikes and we rode out the same sunny Sunday afternoon on a train to avoid the disappointing roads. Our 120 mile train hop south from Bordeaux landed us in Basque Country, in the city of Bayonne. At Bayonne we sort of made it to the Atlantic as it flanks a river that drains into the Atlantic a few miles away. This was the easy part of the scenic gorge road. As soon as we left Bayonne thoughts of the sea were behind us as we were suddenly in the hills--the foothills of the Pyrenees. It was a remarkable change in terrain, scenery and less so, in culture. The river route that Bill plotted with the help of Garmin, his GPS device, was lovely but punishing--Garmin doesn't know about road grades but we do. Our first day out of Bayonne started and finished at close to the same elevation but we rolled up and down about 1700' (530m), mostly on 15-17% grades. If we'd known at the beginning to count them, we surely would have tallied more than a dozen pitches over 15%. The glycogen was quickly being sucked out of my leg muscles with each steep incline, making me wonder how I would have the strength to finish an otherwise moderate day. On one particularly steep spot I had to press past my known limit to keep going because of an oncoming truck and it took minutes of rest to catch my breath. Bill made it up one of the 20% hills but he kindly came back to help me push as I was too pooped to pedal it after a string of exhausting hills. However, it couldn't have been a prettier day to transition towards the mountains. No matter that it was the last week in October, the temperatures soared into the mid-70's and there wasn't a cloud in the sky. We were enough farther south that the maples and oaks were just beginning to put on their fall show. The hills were stunning with alternating patches of green pastures sprinkled with grazing sheep; small mixed forests; and Maidenhair-like ferns that had withered into a uniform, brilliant rust tone. The colors were the same on every building in some villages. 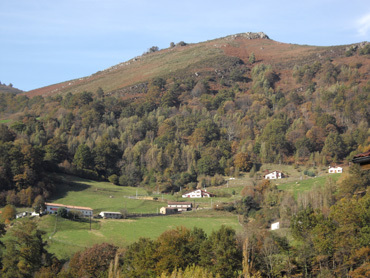 Along with noting the gorgeous fall colors, we were startled by the regional Basque architecture as it appeared that there were strict zoning codes in some villages. Essentially every home in some villages was white with either a deep red or green trim--colors from the Basque flag. The compliance went from curious to being a bit alarming when we began seeing the Basque separatist graffiti on road signs and concrete walls. The uniformity in the housing colors reminded us that, for some individuals, the Basque ethnic pride went beyond a joyous celebration of heritage and was literally a license to kill for their cause. This "Balkanizing" agenda of some Basque and the various other separatist's movements across Europe and beyond is oddly juxtaposed to the other debate in Europe, which for some EU individuals means dropping their national identity and instead identifying themselves as "European." We were disappointed to have our pleasure of the countryside marred by reminders of such hatred but hatred is one of those ever-present realities not far under the surface. Nothing like fall colors to turn our heads. The physical strain and bit of culture-jangling we experienced the first day out of Bayonne was balanced by a forced, short ride the next day. Map Man works overtime to find us congenial back roads with little traffic but that also often means that there is little lodging along the way. 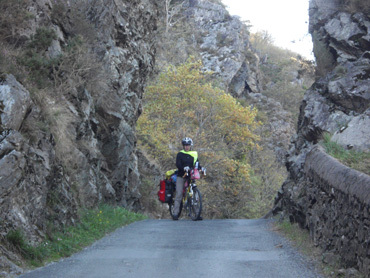 He managed to connect-the-dots to take us over a low Pyrenees pass with the days being "hard-easy-hard" instead of the preferred "moderate-moderate-moderate." But we do what we have to do to make such routes work and having one very short day was a part of the package. And this time we were fortunate in that it was paired with the previous, very difficult day. Being a stunning fall day helped us to linger and ponder long enough so as not to show up at the tiny hotel too early on the too-short riding day. We spent more time picking the view to accompany our river side picnic than usual; stopped to look inside the only church on the road; and tried dozens of times to capture the experience of the fall colors in photos. Unlike the hard day before or those several weeks of cold, cold days, this was a "being" day instead of a "doing" day. We floated along taking in the colors, the sounds, and the smells against a backdrop of little commotion. The question on days like this isn't "Why are we doing this?" but "Why would you be doing anything else?" Several vicious storms have recently whipped across Europe and dragged the jet stream far south into the Mediterranean. Luckily Spain has been spared the rains but it has not escaped the winds. Unfortunately for us, the gusty blasts have been headwinds and we've retreated to the safety of sightseeing on foot instead of riding the truck routes, the only roads available to us in central Spain. But hey, blue skies in November--who can complain? We are reluctantly wrapping up our 2009 touring season, Season #9, which officially ends with our flight home on December 3rd. Our spate of recent year-end planning sessions made it clear that Portugal should not be our final destination for the year and instead Seville, Spain is now the terminus. Portugal had been an arbitrary recommendation on my part back in April when I was recognizing my "Balkan fatigue" while grimacing on the busy roads of Montenegro. We always end the year in the south of Europe and Croatia and Montenegro had pulled us east for several years for a number of reasons. But this spring unexplored Portugal was attractive solely because we hadn't been there and didn't know why we wouldn't like it. Taking the recommendation of a Seattle cyclist that we met in Montenegro who has been living in Morocco, we decided to visit Morocco in March 2010 without the bikes. Surprisingly, one can't get to Morocco from Portugal though there are a multitude of options from Spain, so Spain became the compelling destination for this year. We'll stash our bikes in Seville over the winter and Portugal will become the first biking objective for Season #10.